With case studies from China, Cuba, Singapore, Vietnam, Burma, the United Arab Emirates, Saudi Arabia, and Egypt, this book tests the assumption that the Internet poses a threat to authoritarian regimes. As the Internet diffuses across the globe, many have come to believe that the technology poses an insurmountable threat to authoritarian rule. Grounded in the Internet's early libertarian culture and predicated on anecdotes pulled from diverse political climates, this conventional wisdom has informed the views of policy makers, business leaders, and media pundits alike. Yet few studies have sought to systematically analyze the exact ways in which Internet use may lay the basis for political change. 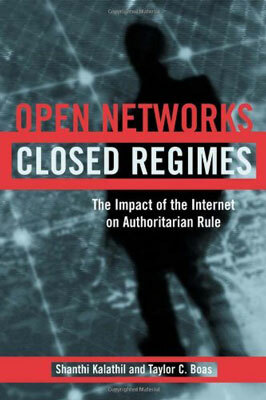 Open Networks, Closed Regimes, the authors take a comprehensive look at how a broad range of societal and political actors in eight authoritarian and semi-authoritarian countries employ the Internet. Based on methodical assessment of evidence from these cases—China, Cuba, Singapore, Vietnam, Burma, the United Arab Emirates, Saudi Arabia, and Egypt—the study contends that the Internet is not necessarily a threat to authoritarian regimes. "Many hope that information technology will generate new opportunities for global communications, breaking down national barriers even in dictatorial regimes with minimal freedom of the press. Kalathil and Boas provide a path-breaking and thoughtful analysis of this issue. A fascinating study, this should be widely read by all concerned with understanding and promoting democratization, regime change, and new information technology." "This is must reading for anyone interested in learning from evidence, rather than widely accepted assumptions, how the influence of the Internet is used." "An important guide to scholars and policy makers concerned with understanding the conditions under which the Internet may foster democratic change." "...provides a timely, welcome and overdue counter to simplistic claims for the politically liberating effects of the Internet." "Kalathil and Boas explore a key proposition of the information age: that the growth of the Internet will weaken dictators and foster democracy. Their research is solid, their analysis stimulating, and their findings should make us pause, rethink, and refocus…The study should be read by policy makers, business exponents, and civil-society activists who want to make the world more open." "A useful summary and analysis of the current debate over whether the Internet is a tool for liberalization or repression. This work will aid policy makers as we examine the issue over the coming months and years." "An articulate and well-researched analysis of the current role of the Internet in authoritarian societies. The conclusion is a sobering one-the Internet is by no means a guaranteed 'silver-bullet' in eluding and indeed, defeating, the control of authoritarian rulers." "Through a country-by-country analysis, Kalathil and Boas shed light on practices formerly known only by anecdote, and their findings chip away at the apocryphal notion that going digital necessarily means going democratic. Their work answers a number of important questions, and frames a worthy challenge to those who wish to deploy technology for the cause of political openness."